Note: see protest flier at bottom. As we plod along daily in this time of great change, we activists for the Earth often feel paradoxically that nothing is changing. More and more of us fear the clock is ticking faster and faster toward extinction. At the same time there are clear signs we should soon expect a better way of living in balance with the Earth to come about fairly soon. No one has hit the right lever, it seems, to allow everyone to "break on through to the other side," as the Doors exhorted. We see tragic trends of destruction persisting at the same time that small bursts of awareness often illuminate a growing number of people paying attention. Some needed an impact in their personal lives to be brought low off their material cloud, while others have steadily kept learning and expanding their awareness of the big picture. The question for those asking is: "What will it take?" As any anti-nuclear activist from way back knows, dating prior to our movement's defeat of Diablo Canyon -- situated as it is right near one more California earthquake fault, unknown when the reactors were approved and built -- the Fukushima disaster ought to be the wake-up call for critical mass (pardon the pun). But not so far; one has to almost admit to insanity to have dared imagine that Japan's obvious catastrophe was not enough of a global body blow to galvanize the public to demand an end to a clear threat. The leakage and spewing of massive radiation is still underway, while the public is deceived so the wheels of commerce can grind on. A docile population would rather not really know, or wants to believe that an event worse than Chernobyl is something we can withstand again and again. "Maybe if we ignore the environment, it will go away." For one to remain focused on what needs to be done has increasingly meant taking care of just oneself -- for to fight another day, we need to get through this one. The System we are up against is finely tuned to stifle resistance and encourage consuming as the only game in town. Isn't there something we can do to stimulate positive action before the next BP-Gulf gusher or Fukushima? I don't have a definitive answer, but I feel confident that as we ride this wave of unprecedented, precarious historic change, we can ascertain guiding forces as well as appropriate responses on various levels. My gut feeling and dream is that a mass awakening and movement will be from the heart, with music and other art forms becoming central in our lives. Until that becomes obvious, most citizens feel forced to continue the commute or the job search, for often meaningless work, increasingly wondering how the future will provide for them and their children. What happens when the screens go black? Answer: the art of conversation will return, although shouts and violence may drown out level-headed thinking if we are not prepared to work together. It would help if everyone first realized that the specialized, isolated function for the consumer economy may soon be obsolete. For the average citizen, it doesn't seem possible for life to radically slow down and become centered around meeting basic needs in our communities through our own local resources. After all, the (imploding) economy runs much of our lives, even as it makes itself increasingly clear as a mere house of cards. It is built on dwindling, once-cheap oil. The much vaunted "clean energy economy" is still just an idea. So we are all extremely vulnerable to a geopolitical "surprise" involving oil supply passing through the Persian Gulf and Suez Canal. A disruption of the flow can usher in sudden failure for the work force to get to jobs and for goods to arrive by cargo ship and trucks to the stores we take for granted. Our so-called leaders don't acknowledge that failure of the oil infrastructure/economic collapse and Nature Batting Last are the overwhelmingly huge forces to heed. Get ready. Add those extra skills, meet your neighbors, bring your family back together, and simplify your lifestyle. The benefits outweigh the apparent sacrifices. Waiting until you get that additional college degree for a better job may soon be seen as the strategy of yesteryear -- back when competitive upward mobility ruled. It's probably time to sing a song for others to hear and join in, and feel the beat of the Earth. Leave the car behind deliberately; you'll have to sooner or later anyway. Can you imagine towing a bike cart or hoisting a sail? We can be more proactive than simply anticipating the faltering system's accelerated collapse. Picking up the gun is a somewhat popular "solution" for both the individual survivalist and the revolutionary fantasizer who are anticipating either a breakdown of social order or an eco-warrior uprising. Let us rather take note of Gandhi's and King's evolved wisdom for social change: live now the transformation in human social behavior we need to see, so as to replace ethically the dominant system of oppression and exploitation. Envisioning a better world than what Western Civilization has wrought means letting go of cherished assumptions, such as mastery over nature and the "march of progress." It is hard for modern people to picture themselves living as their great-grandparents did, let alone the way displaced tribal cultures managed for many thousands of years. It's worth debating and speculating on lifestyles in the post-peak oil epoch, but whatever the future holds will depend on an open-minded, pragmatic approach that takes "the Seventh Generation" into account. Until the next dam bursts as part of our industrial folly, I'm afraid we'll have to wait to see how well we come together and ensure that what is left of our battered, fragmented world can be salvaged for an age of peace and harmony. 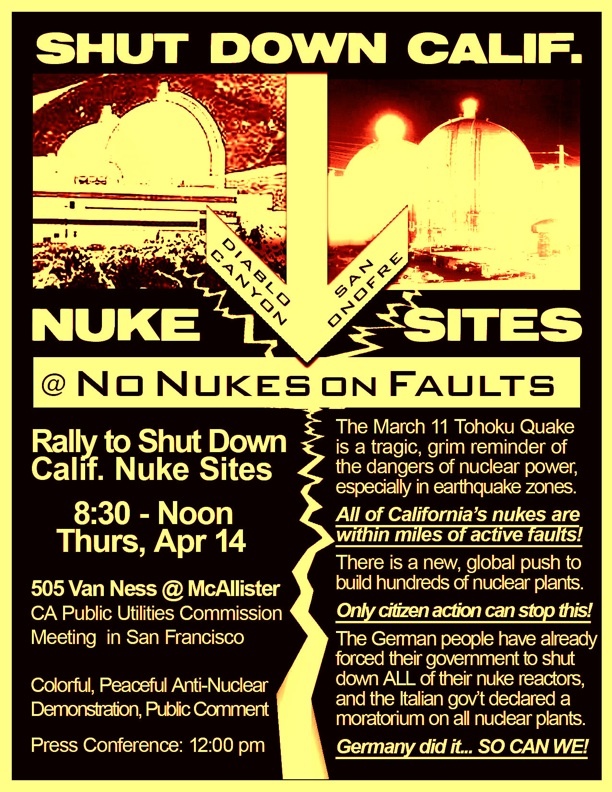 Could our upcoming protests this week in San Francisco at the Public Utilities Commission and in San Luis Obispo have swayed the nuke owner to take a step back? Headline: "PG&E wants Diablo Canyon nuclear plant license delay for seismic study"
MASS DEMONSTRATION at CA Public Utilities Commission (CPUC) Meeting CLOSE ALL NUCLEAR FACILITIES ON FAULT LINES! It Happened in Japan, It can Happen HERE! Close Diablo Canyon BEFORE it does. Event 1: April 14 in San Francisco 9am-Noon at the California Public Utilities Commission Building. The Public Utilities Commission is in charge of approving the budget for Diablo Canyon Nuclear Facility. Let's show them how the public feels about funding Nuclear Power on Fault Lines! Guest speakers will include Starhawk and others TBA. You can also sign up to speak at the meeting. Stand for the safety and health of our communities! 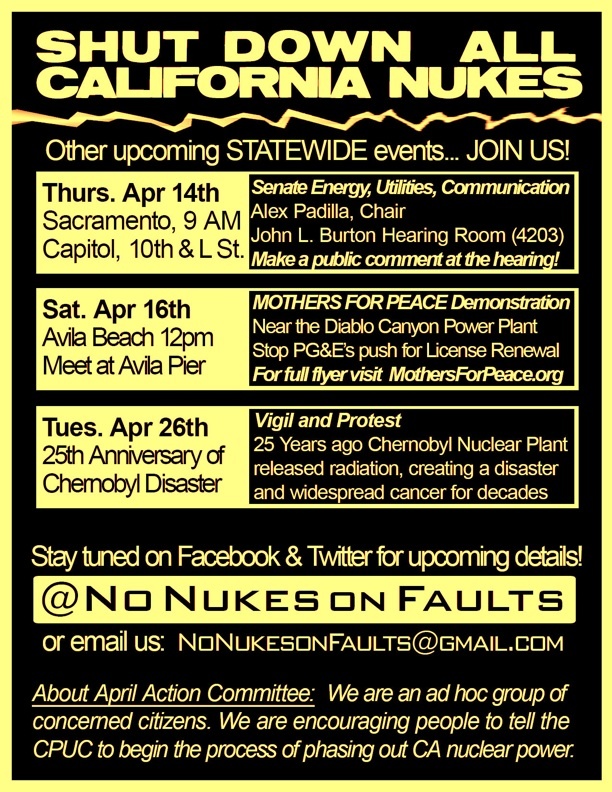 Event 2: April 16 in San Luis Obispo -- Mothers for Peace and allies will demonstrate against the nuke on the coast. "Picking up the gun is a somewhat popular "solution"..."
But it's a typically American solution, ideally fit for people who have been taught that violence pays. It's also a "doomer" solution, possibly more appropriate if you expect a sudden crash with roaming bands of starving zombies. I find it more likely that the crash will be slow -- over the remaining life-time of today's baby-boomers. (Or possibly a bit longer, as the baby-boomers become the first generation in history to have shorter lifetimes than their parents.) And in a slow crash, guns aren't going to mean much. Humanity will go out with a whimper, not a crash. I cannot forget, or forgive, your main contradiction. You yell for help (discreetly) over and over again; but when approached from the only standpoint I know of that offers effective, positive results, you wouldn't even look. That refusal even to look might make sense, if indeed you remained The Only One In Existence who has Right Answers. I do notice evidence of your pain, and of at least some earnestness; and for those I honor you. I started working on our survival crisis (in the most general sense) in school year 1947-48, and in a focused way (explicitly using the phrase "survival crisis") in 1965. In 1969, it became unmistakably apparent that no one with money would support this line of research, so -- "Damn the torpedoes!" -- I continued it anyway, working full-time as a theorist at no pay, from then to now. As a quick way of summarizing the thrust of my long-term research project, I say that I and my collaborators have opened up the field of studying self-destructive human behavior at the level of culture-and-language; and that the obverse side of our insights on that topic gives specific guidance towards developing a diversity of viable, sustainable, life-affirming, respectful-and-grateful ways for humans to live. I and my collaborators have done this work at levels of rigor unattainable within the mega-culture you oppose-and-espouse--the one which the visionary novelist Daniel Quinn calls "the currently dominant world culture." I too acknowledge that I don't have "a definitive answer". My chosen most-fundamental premises teach me that whatever I (or any other human) take(s) in, what I make of it, and what I do with it remains intrinsically inaccurate (to some degree), incomplete (to some degree), and unavoidably self-reflexive. Exponents of the dominant culture claim that their culture has attained "the one-and-only Right Way to Live". What they 'know' (in their opinion) remains entirely accurate, exhaustively complete, and "ob-jective" (free of self-reference). And I do have what nobody else seems to have, or even to claim to have: a procedure, now in its ninetieth year of development. (I didn't start it -- I joined it as a peer, an equal, in 1950; and I and my collaborators have carried it much further than its originator and his collaborators did.) So far, this procedure has remained productive indeed. Do you still decline even to look at this body of insights, to see if it holds anything that might prove useful to you in your own quest? That will bring up links in the left-hand margin of the page, including "Research". Clicking that link will take you to a listing of my papers, in reverse chronological order. Brief summaries of most of them should appear there, with copies of perhaps a bit more than half of my 140 or so papers, to read onscreen or to download. If you want to talk, ask for recommended papers on given topics, etc., you can often reach me at 1-660-627-2519. I don't know how to go to bed early, so I don't get up early. In general, afternoons or evenings will fit my schedule relatively well. That will take you to a page with links along the left-hand page margin. Click on "Research". That in turn will take you to a listing of my papers, in reverse chronological order. The listing includes brief summaries of some of the papers. You will find links to copies of perhaps more than half of my 140 or so papers, allowing you to read online or to download. If you want to talk with me, ask for recommended papers on specific topics, request clarification of points of argument you didn't understand, etc., you can often find me available at 1-660-627-2519. In general, I don't know how to go to bed early, so I do not get up early. Afternoons or evenings often fit into my schedule easily. Sorry to have posted my remarks twice. I didn't understand the workings of the Comment system.